I prefer to use terminal and spend most of the time using it. 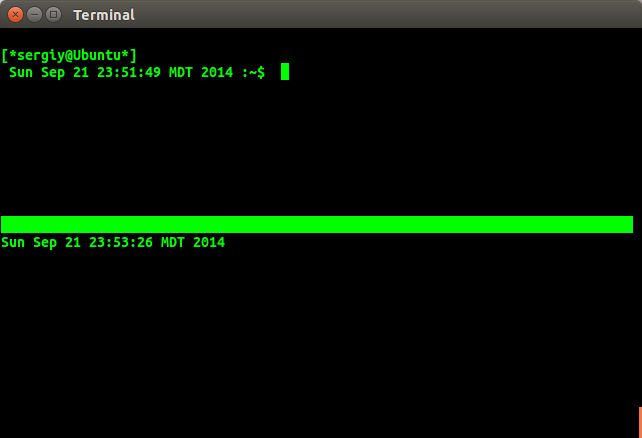 I am searching a way to see time in terminal while I use it parallel. The time would change automatically when it passes. It would be awesome if it would display left to my command prompt. or any other format. where 06:27:01 is the time. What I want is just to show the time which changes when seconds pass. So is there any way to achieve this? I'm not sure that is so simple to achieve this using the default bash shell (but I'm not saying that it's impossible). You will probably need a command/function which is able to refresh the command prompt every second without interfering with anything you type on the prompt. The Z shell (zsh) has a built-in command, called zle, which, when used with the reset-prompt argument, forces the prompt to be re-expanded, then redisplays the edit buffer. When you run zsh for the first time, choose 0 when you are asked. If you like it, run chsh -s /bin/zsh to change your current shell to /bin/zsh (a re-login is required for this change to take effect). Run exit if you want to exit from zsh shell. 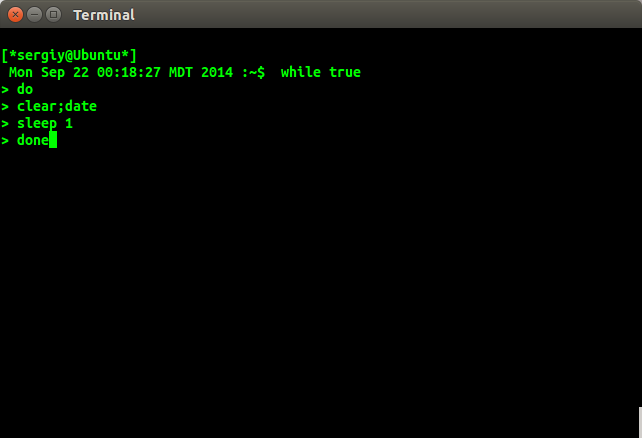 If you want to display running time in your terminal you can use this command. 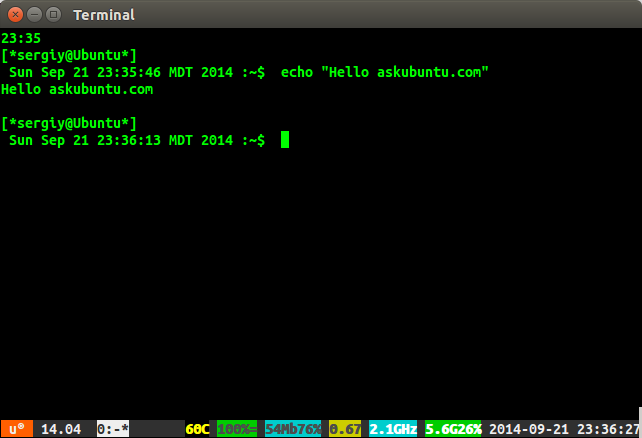 It will display time in the upper right side of your terminal. But note that displaying time using this command sometime may overlap the text present in terminal. So use this command with little caution. But in this method your time will refresh only after pressing enter. If you want to above method permanent add the above command(the one you like or both) in your ~.bashrc file. This question has been bothering me for a few days, and here's my edited post with all the material I've learned. 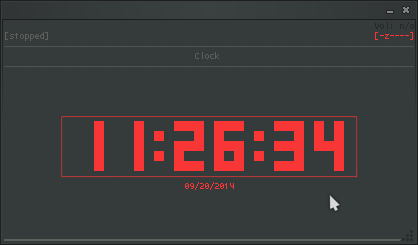 Specifically , my goal was to achieve showing clock next to prompt in BASH. Just like Radu Radeanu mentioned in his answer, the key is to find a function or variable what is able to constantly refresh the command prompt or redraw the screen, without interfering with your screen or with whatever you type. While, this is possible to achieve with while loop, as shown by G_P, the constant redrawing of the screen with tput function messes up with whatever text is on my screen at the instant it refreshes. I've come pretty close to achieving what the OP asked by modifying somewhat the code G_P posted , but still I believe Radu's answer is the closest to what OP wants. Without further ado, here's some of the things I've learned, presented for your judgement. Terminal multiplexer is a software that allows splitting the terminal screen into two or more screens. In particular, I want to draw attention to Byobu terminal. This ncurses based terminal emulator, allows you to show time, CPU percentage, memory, and whole bunch of other indicators. In the screenshot from my byobu terminal you can see cpu temperature, battery percentage, internet connection quality, CPU frequency, RAM, date, and of course time. If you're mostly concerned with constantly monitoring these things while in terminal, Byobu is the way to go. In fact , I've come to like it so much, I've set it to automatically load while login into tty. The only quirk is that in tty you can't actually merge the separate windows - only switch between tabs with F3 and F4 keys. An alternate solution involving multiplexing windows is by using splitvt, which splits the screen into two parts. 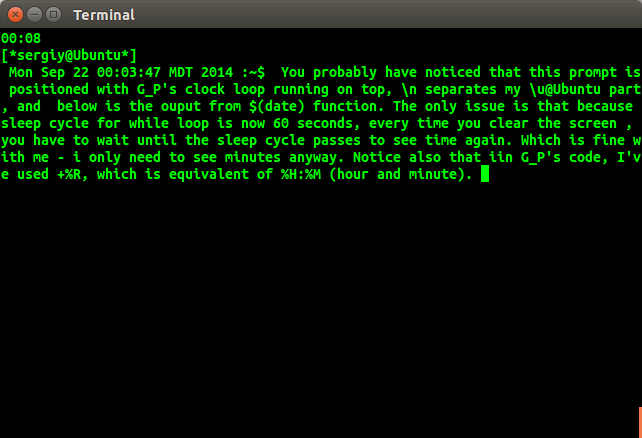 You can run a terminal clock such as tty-clock , use watch command with date, or you can code one yourself with a script. More on that later. In the screenshot you can see one part of the split with normal bash prompt on top, and in the lower one you can see a script running, that just constantly refreshes output of date command with clear command. #2 , While Do Loop and tput This is probably the closent to what the person who asked the question wanted implemented with bash. Note, the tput cup 0 0 places clock into upper right corner of the screen, right above my prompt and sleep 60 changes sleep cycle to 60 seconds, because that way I can monitor only hours and minutes instead of every second. This way, whatever text i have on the screen isn't affected, for the most part (only when i happen to run a command the same time clock refreshes). PS1 line is already in your .bashrc profile, so you just need to tweak it a little. The while do loop should be added somewhere in the same file, preferably in the end with # comment that this is stuff you added initially. And don't forget to always back up any file like that just in case you make bubu and need to go back to the way it was. This part is merely for those who want to see time. For those who want to constantly monitor it, #1 and #2 are preferred options. So as we already have seen the while do loop is pretty useful. Here's how you can create a clock with while do loop, date, and sleep commands. Now you can run that script with splitvt in one instance of bash, while working in the other. Another solution is watch -n1 date command, which will continuously execute date command with period of 1 second. In Conclusion: I've learned some things while trying to find the answer to this question, and I hope my findings helped you in some way, and I hope I was able to contribute on this question. Byobu terminal IMHO is the best solution, but decide for yourself, make some research, and choose whichever way works best for you. After else statement the first line is commented out with # (this is my old prompt), now the second line is the one you want, and specifically \t operator. That shows running time in 24 hour format. For more info check out this . Also a small note, I'm using the stuff after else, because i'm not using colored prompt. PS: Please let me know if I should add anything to my answer or edit it in any way, but for the most part i believe this is most conclusive answer i could come up with, and at least I personally won't be adding anything new to it. for time in 12 hour format. You can view the bash documentation for other options. Search for "8. Create your own prompt using the available codes for PS1 variable" in that above page. I really like the ncmpcpp clock feature, triggered by 0-key (see screenshot). For more detail on the installation procedure, please refer to this post. Adding timestamps to terminal prompts? How do I remove computer name from the command line prompt? How to set the default terminal window screen co-ordinates when Ctrl + Alt + T is pressed?